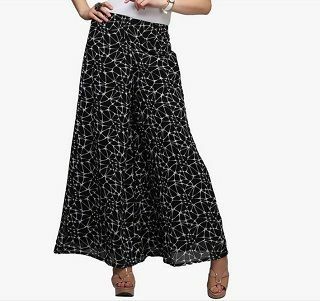 15 *Beautiful* Palazzo Pants That’ll Go With ALL Your Kurtis! 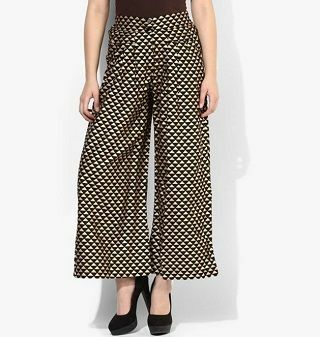 Palazzos should just be renamed ‘summer pants’ because of the sheer comfort they provide and how fashionable they look all season! They can be worn to work, to college or, if styled well, even to a party. 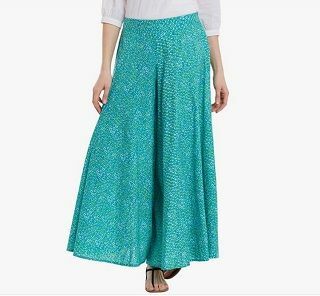 Here are 15 pretty palazzo pants to pair with kurtas… and kurtis too! What’s better than a pair of palazzos that are light coloured and have a pretty print running all through them? They’re perfect for this season! Style this pair with a white kurti and a pair of kolhapuris to look absolutely dashing! Price: Rs 749. Buy it here. Quite a stunning pair, isn’t it? The golden print on the side really looks brilliant and different. 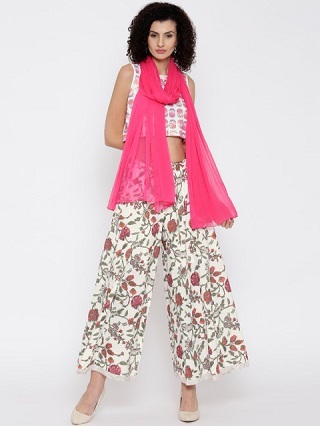 Go for a high slit floral kurta that is bright and summery, to create a great look! 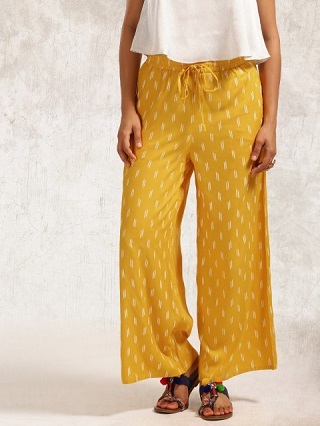 These beautiful mustard palazzo pants will definitely match all your kurtis. Style it with bohemian fringe sandals to look absolutely on point! Price: Rs 699. Buy it here. These beautiful palazzos will go well with all your kurtas. You can even pair them with a crop top to ace the fusion wear look! Price: Rs 1,399. Buy it here. An orange pair of palazzos says summer like nothing else. 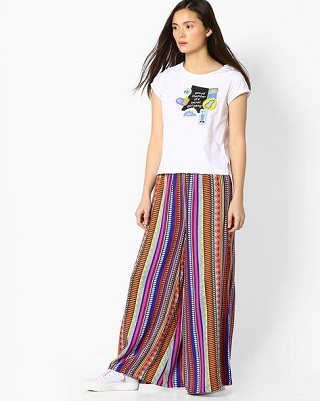 You can pair it with a plain kurti or even a pretty oversized kurta. Wear a shrug over it, along with matching earrings, to complete the look. Price: Rs 550. Buy it here. 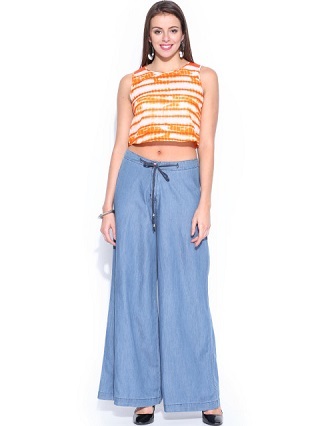 This one is the right mix of denims and palazzos! 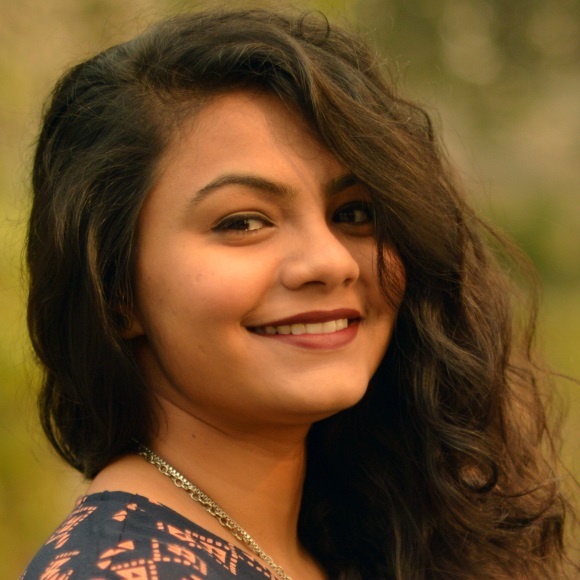 You can pair it with all your kurtis and look on trend. Keep your hair in a tight bun and grab some chunky bracelets. Price: Rs 1,199. Buy it here. This turquoise coloured pair is such a stunner. Pair it with a beautiful fuschia pink kurta or an orange kurti. You’ll look fresh and feel cool, on a sweltering hot summer day. These palazzos have the right amount of print and the right mix of colours to make you stand out. Pair them with fancy juttis and a cute fishtail braid. You’ll look great! Price: Rs 1,799. Buy it here. Tye-dye is an age old technique of dyeing fabric with a resist to create a pattern. This one is rather fancy! It can totally be paired with sneakers and bright colored accessories. Price: Rs 1,699. Buy it here. 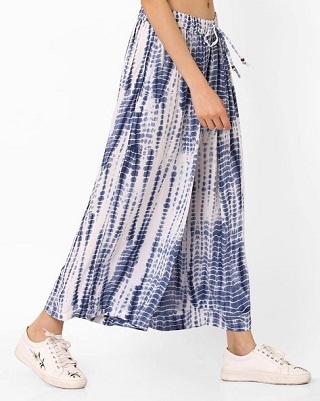 Vertical stripes have an elongating effect and look absolutely beautiful when paired with a deep blue or black kurta. You can also create a super pretty look by adding a lot of desi accessories! Price: Rs 899. Buy it here. 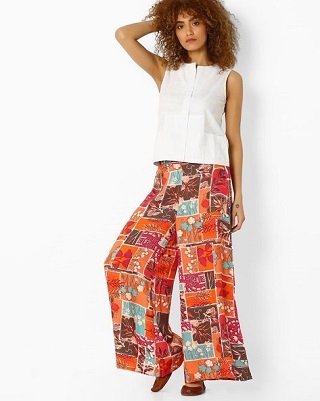 This fun and quirky pair of palazzos will look amazing with a bright coloured kurti. Pair it with cute Indian flats to look tres chic! Price: Rs 899. Buy it here. Abstract prints are all the rage this season, and this pair takes the style quotient up a notch! You can totally wear these to a brunch date or even to a party. Simply replace the kurta with a shimmery, glittery top! Price: Rs 839. Buy it here. This one’s for all those shaadi functions where you want to look super hot! 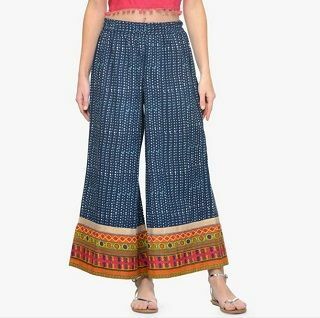 Pair these with a heavy suit or an embroidered kurti and strut in style, ladies! Price: Rs 650. Buy it here. If you love mixing Indian with western, just go hit the buy button already. This classy looking pair will work as formal, Indian and western wear! Price: Rs 1,999. Buy it here. A simple, suave design always looks amazing. 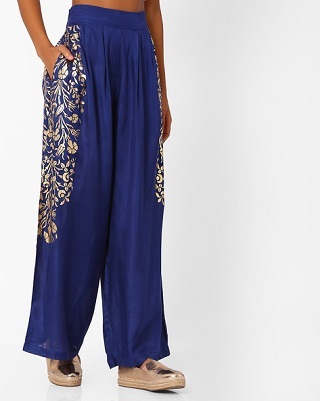 You can wear these leheriya palazzos with a black anarkali type kurta! We absolutely love them! Price: Rs 909. Buy it here. Happy shopping, everyone!